2. We will email you the invoice. Invoice contains our ICICI bank details. 3. Deposit cash or cheque to ICICI BANK or Online transfer through NEFT. 4. Inform us by email that you have made payment. 5. We will make your advertisement live as soon as we receive the payment. Your advertisement will be displayed on Jobs Section within m-Indicator. Candidates read the advertisement and submit their details to JOBS INDICATOR. 6. Daily at 10 am we will email you report of candidates who have applied for your job. This report contains excel sheet containing Name, Qualification, Experience, Home Location, Birth Year, Phone Number and Email id of the candidates. Dear valued customer, we work on 100% advanced payments only. 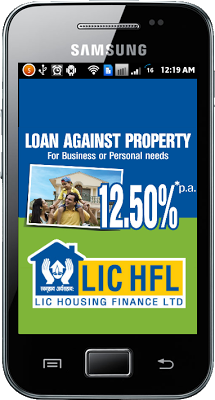 Any queries are to be resolved within 5 working days after launch of the advertisement campaign. Text Classified is affordable mode of advertisement even for small businesses and individuals. TEXT CLASSIFIED is displayed mainly on android and Windows Phone m-Indicator exit page. 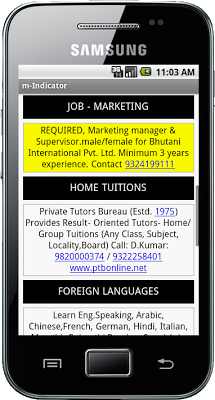 People having Blackberry, Nokia, Micromax can see this page by clicking on Classifieds Icons inside the application. This medium is best if you specifically want to reach people of Mumbai, Navi Mumbai and Thane region. People can easily contact you by clicking on the phone number hence number of respondents increases. When people click on your email id in the advertisement, 'compose mail' application opens in android phones which are used by most of the people. People can immediately respond you through email. If you have included your website link then people can instantly visit your website to know more details about your products and services. On every Monday you will receive report of the number of clicks on your advertisement. It can give you fair idea about how your advertisement is performing on m-Indicator. Classifed Advertisement 200 characters (alphabets) Rs.400 + GST, 7 days for Ad with Max Salary 10,000. Rs.1200 + GST, 7 days for Ad with Max Salary 15,000. Rs.1750 + GST, 7 days for Ad with Max Salary more than 15,000. Offer valid till 31st Dec 2018. Graphical advertisement creates more impact. Exit Display advertisement is always visible to user. EXIT DISPLAY is mainly shown on android and Windows Phone m-Indicator exit page. People can watch movie trailer or product demo in a single tap on your advertisement.It opens You Tube application inside android phone. When people click on the your email id in the advertisement, compose mail application opens in android phones which are used by most of the people. People can immediately respond you through email. i) m-Indicator uses "DoubleClick for Publishers" (dfp) by Google to track ad impressions & clicks. ii) Advertiser having Google account, can log in to dfp and view his report. iii) dfp ensures 100% transparency. Pop up from the top of the application takes instant attention. Graphical advertisement creates impact on the user. APP BANNER is shown at top position mainly on android m-Indicator inside main application pages. People can watch movie trailer or product demo in a single tap on your advertisement.It opens You Tube mobile website. How advertiser can verify advertisements delivery by m-Indicator? m-Indicator is NOT an official publication of Indian Railways or BEST or RTO or any other transport authority. Train timings may not be matched with actual timings. PNR status and SPOT train service is provided by INDIAN RAILWAYS, premium SMS charges (generally Rs.3) are applicable. m-Indicator just acts as an interface to this service. Mobond is not responsible for any damage caused by the information shown by this software. Please cross verify the information. You may incur call or SMS charges for using certain services. Contact your service provider for the details regarding charges. You may receive text messages (SMS) or notifications or emails from Mobond containing new product information, updates, alerts etc. You agree that messages from Mobond, received on your registered number will not constitute an unsolicited commercial communication irrespective of their having signed upto any Do Not Call Registry.